This pest threatens all fruit trees: pear, apple, asian pear, and quince. All pome fruit is affected and will be useless if no level of control is achieved. The Horticultural Pest Control Board has developed an effective program designed to protect both commercial orchards and the homeowner’s fruit tree investment. 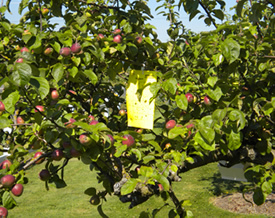 To detect the current level of apple maggot infestation, traps are monitored on apples trees within a 1/2 -mile radius of a commercial orchard. Traps are monitored by the Skagit County Horticultural Pest Control Coordinator and WSDA. Traps are available for purchase at the WSU Skagit County Extension office for any home owner’s use. Upon a home owner’s request, the Pest Coordinator will assist in monitoring backyard orchards or trees. Pick up and dispose of fallen apples in the trash – DO NOT COMPOST!!! Fallen apples can be fed to livestock if desired. Fallen apples can be stored over winter in durable black lawn bags – make sure the bags are tied tightly to prevent the maggot spreading to the soil, let the sun bake them, roll the bags often, let them freeze over winter, then the following spring they can be used to spread as compost. Stay in touch with the Skagit County Horticultural Pest Control Coordinator. If one apple maggot is detected within an orchard, the orchard is put under quarantine – meaning that the apples cannot leave Skagit County. If one apple maggot is detected within a 1-mile radius of the orchard, the apples are put on threatened status – meaning that in order for the apples to leave Skagit County they have to be inspected by the WSDA at the expense of the orchardist. 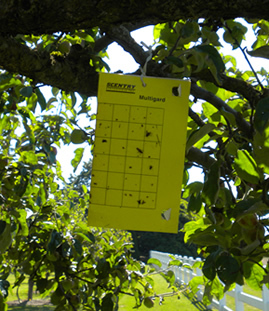 The Skagit County Horticultural Pest Control Coordinator will be able to answer your questions about apple maggot and trap placement. The office is located at 11768 Westar Lane, Suite A in Burlington, phone number 428-4270. Yellow traps are available for purchase at the Extension office, or you can purchase them from private vendors. Please help save Skagit apples by cooperating with the Pest and Disease Board and by doing your part to keep this insect out of our local apples. NOTE: Make sure “apple” is listed as a crop on the label of the insecticide product you purchase. Use pesticides with care. Follow all label precautions to protect yourself and others around you. It is a violation of the law to disregard label direction. If pesticides are spilled on skin or clothing, remove clothing and wash skin thoroughly. Store pesticides in their original containers and keep them out of the reach of children, pets, and animals. For questions about apple maggot, contact the Skagit County Horticultural Pest Control Coordinator, 360/708-2362 or your local WSU Extension office.